Former shark lawyer Gabe returns to Clover Park for the stress-free lifestyle only to corner the market on ridiculous "legal" cases. When Zoe comes to him asking for legal advice, Gabe's solution is a shock even to him. Gabe's got good reason to avoid anything permanent, so when Zoe tells him she'll only be staying a month, he figures it's the perfect situation. But when passion flares this hot, someone is bound to get burned. 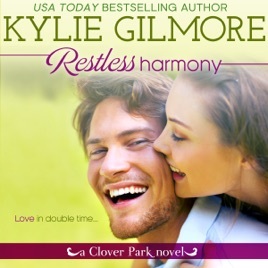 I absolutely loved everything about Restless Harmony! From Gabe and Zoe's love story to all of Gabe's brothers. The family dynamics between Gabe and his brothers had me thinking of my own family. Vinnie and Allie are a true love story. I loved that Vinnie waited three years for her. I know that the main story is about Gabe and Zoe but I adored the whole family. Zoe is looking for a lima bean and tells Gabe that he isn't her lima bean. But what if he is? You should definitely read this story and fall in love with the Reynolds/Marino clan like I did! I love Gabe. He is deeply hurt by loss and it all began with losing his twin in the womb. I cannot believe he carried that pain for so long and continually blamed himself for the deaths of those around him. Zoe misses information and holds herself to an impossible standard. She is basing her success on the past successes of her family. She also does not see the obvious about Jordan.